Most of our friends opted not to bring their boats to Singapore. They either stayed in Indonesia or went to Malaysia, entering Singapore via public transit. The reasoning is that you don’t have to pay to clear into Singapore and the marinas in Malaysia or Indonesia are a lot cheaper. We went to Singapore anyway, as we wanted a few days in the city and there were some boat projects we needed to do. What About Cruising in Singapore? You MUST hire an agent to bring your boat to Singapore. After reading about the clear in procedures on Noonsite I contacted Craft Docket LLP. I was really pleased with the services – all our communication was done via email or What’s App and they were very responsive. I gave them a rough estimate for our arrival date when I first reached out. A few days before we made the transit from Bintan to Singapore I updated them again – pushing our departure date back one day. Two days before we left, Craft Docket emailed me all of our paperwork with instructions for how many copies of each document to print and instructions for clearing in, plus a reminder to send them copies of our exit paperwork from Indonesia. We departed early in the morning from Bintan Resorts Marina. 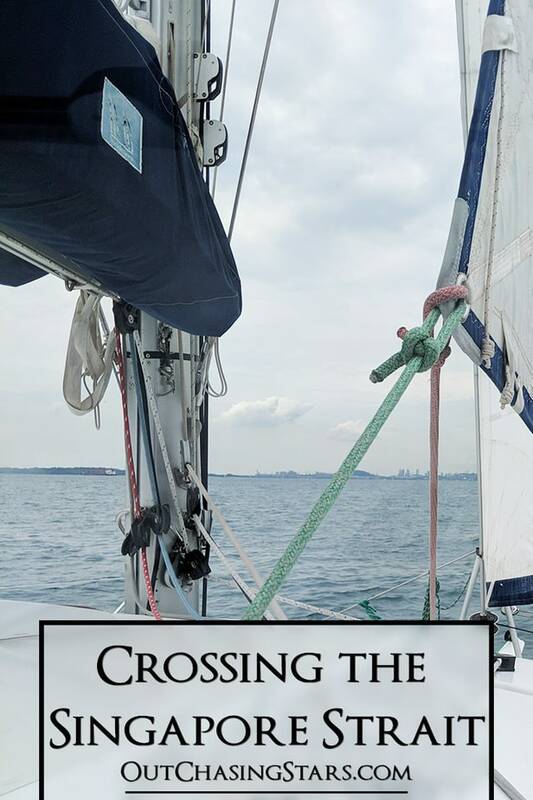 Our goal was the cross traffic area just north of Batam, then the Western Quarantine and Immigration Anchorage (WQIA), which was just two miles from our final destination, ONE°15 Marina in Sentosa. We stayed on the south side of the Singapore Strait, motoring directly into the westerly winds and hugging the north shores of Bintan and Batam. Our AIS maxes out at 150 targets, so Starry Horizons had a small bubble of ships within a very small circle on the chart platter. 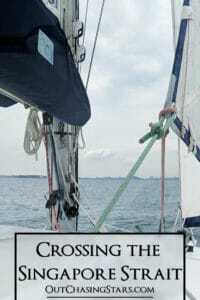 As we approached the cross traffic area, we realized we had a big gap in traffic on both sides of the strait, so it was a perfect time to turn 90 degrees, to cut across the channel. We did have to avoid one cargo ship coming from the east just at the end of our crossing, but overall the crossing took 20 minutes and was a very good window. Pointed directly at Singapore – you can see the Marina Bay Sands Hotel! On the north side of the channel is a big anchorage for cargo ships. There are a lot of smaller boats zipping around to avoid. We hugged the north side of the ship channel and passed just south of St John Islands. The current ripped and swirled in this section, but thankfully we made it through just fine even while running just one engine. As we approached the WQIA, a friend boat of ours, Samara II, was already in the waiting area. We hailed the officers and they approached our boat. Our agent paperwork and passports were in a zip-lock bag, and the official boat nosed up to our beam. David passed the paperwork over the rail. A few minutes later the boat approached again. They passed us our paperwork, and we were cleared into Singapore! There was no inspecting our boat, no questions, it was just so easy. The short distance motoring to the marina entrance was uneventful but it was quite a ride getting in! The current passes the entrance quickly so I really had to gun it for us to get in and be mindful of our momentum once we made it. We docked easily and some staff members were waiting to help tie the lines and set up our shore power. Our neighbor was a $20M mega yacht….in fact, we were the small fry on the dock! Thanks to Xjilien for the picture! Checking in at the office we got a goodie bag and a tour of the facilities. Our last marina was in Cairns, about 130 days ago, and One15 Marina is a stunning facility. While it is expensive, it is not the MOST expensive marina we’ve been to – our most expensive marina was in Portland, Maine, which was similarly priced to Nassau, Bahamas. 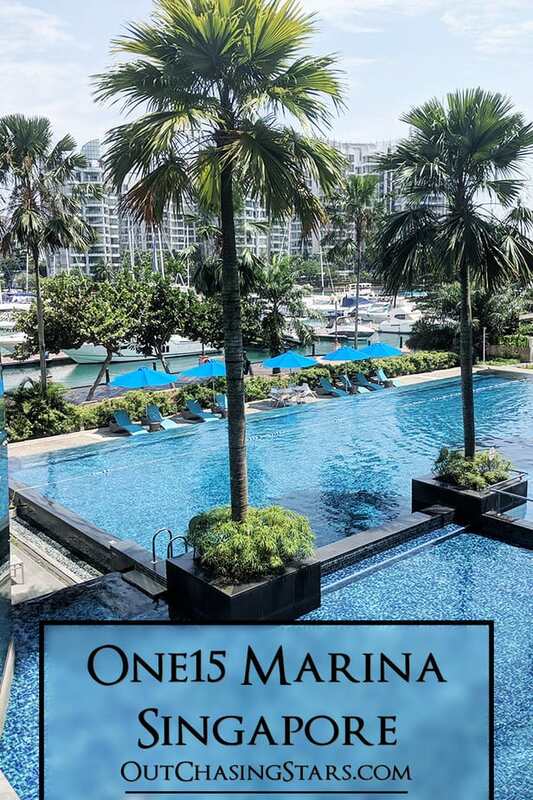 One15 is the nicest marina we’ve ever been to (much nicer than the one in Portland), and it’s been awarded the Best Asian Marina award for 7 years in a row. 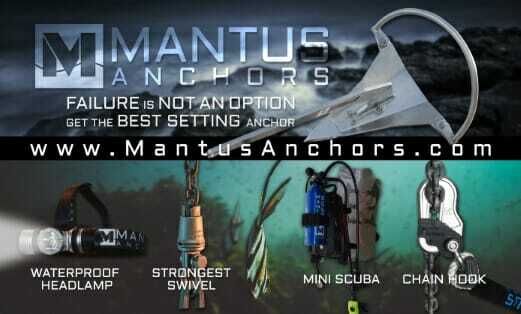 One15 Marina has partnered with Seakeepers Asia, with the goal of creating a coral garden in the marina. 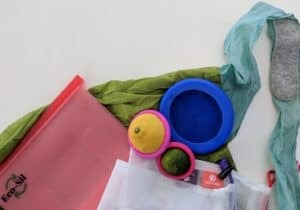 The project just launched in October, so I’ll be interested to see how it progresses if we ever come back! Me, Sarah and Linda taking advantage of the pool. We made excellent use of the facilities while we were here. The marina has several restaurants, a fitness center, a pool, and a beautiful locker room complete with sauna. The pool at One15 Marina. The swag bag, most of which we will never use, but it’s a nice touch. Getting us connected to shore power is no easy task. We carry two cords onboard: one is a full American-to-American plug. The other is a female American plug, which goes into the boat, and bare wires on the other end, which we can swap to use in any country. One15 Marina lent us the proper plug and even wired the plug in, so we were able to connect to shore power and run our air conditioning (with our shore power converter). The $33 SGD we paid for the electrical bill for 6 days of air conditioning was totally worth it! 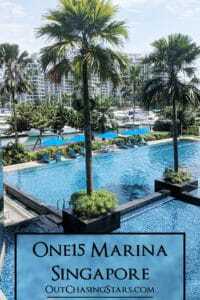 As marina guests, we also received two Sentosa fun passes, which give us discounts on three days of activities around Sentosa Island. 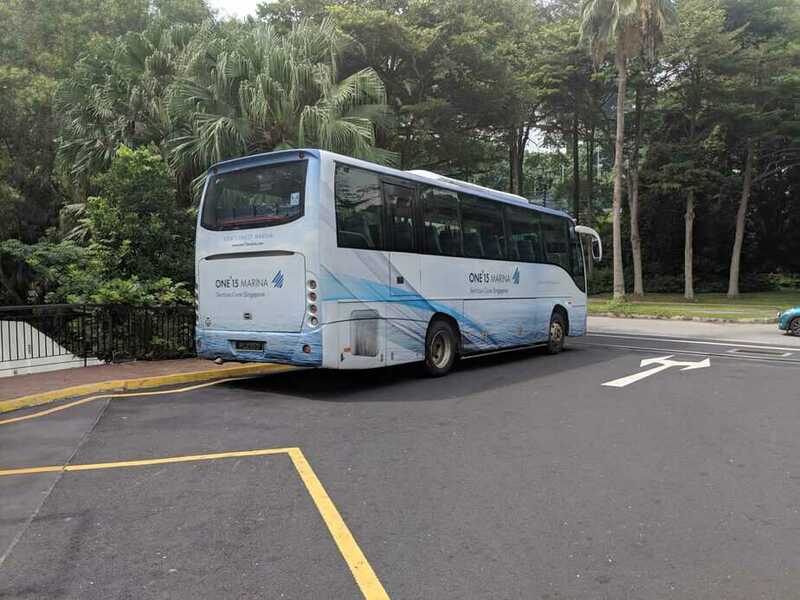 For exploring beyond Sentosa, there is a bus that runs about every half hour directly to Harbourfront and the Vivo Mall. I really enjoyed this area of Sentosa too. It’s very family friendly and walkable. There’s a big playground by the Cold Storage, lots of restaurants in Quayside Isle, and peacocks run wild! Mexican food! we had a great lunch at Two Chefs in Quayside Isle. There is a small ship’s chandlery in the marina, which is kind of a mess but has some items we needed. While in Australia we noticed our freezer beginning to struggle. Years ago, before I knew any better, I tried to shove one of the shelves in backward – they have a taper – and it cracked the inner lining. I didn’t do anything about it, and over time the insulation saturated with moisture and the compressor was working harder to keep temperature. Isotherm has a distributor in Singapore, so months in advance we ordered a new freezer to be ready and waiting for us. With free delivery to the dock, David plugged the new freezer in and it worked like a charm! There were two beautiful westernize grocery stores within walking distance from our dock in Sentosa. The closest one was Cold Storage, the popular chain of stores in Singapore. I was surprised at how much of the food came from the US instead of Australia or New Zealand or locally. I found boxed stuffing for our upcoming Thanksgiving dinner and proper American bacon, which was very exciting! Jason’s, a gourmet grocer, is just a few more minutes away. Also owned by Cold Storage, Jason’s carries more high-market items like organics, delicatessen items, and allergen-specific foods. Two of our followers reached out to us in Singapore and we invited them over for dinner on SH. It was a blast to get to meet some locals and hear their stories. Plus, Troy was able to procure some parts we needed and Xjilien introduced us to Awfully Chocolate…win-win for everyone. My cousin Sarah has been living in Kuala Lumpur for a few months doing an internship with the UN. She flew down to join us in Singapore and stay for 10 days, exiting in Langkawi. Carlos and Linda from Mirniy Okean (22 South) have been our cruising buddies since we met them in Cairns. Linda has to fly back to New Caledonia, leaving Carlos to single hand for two months. Mirniy was in Puteri, Malaysia, and Linda was flying out of Singapore. Carlos and Linda came to join us for two days and one night in Singapore. It was a full house aboard Starry Horizons, and Linda helped me christen my new crepe pan for brunch. Brunch crepes aboard Starry Horizons. There aren’t many islands in Singapore, and there is so much boating traffic with the ship channel that cruising just isn’t attractive. 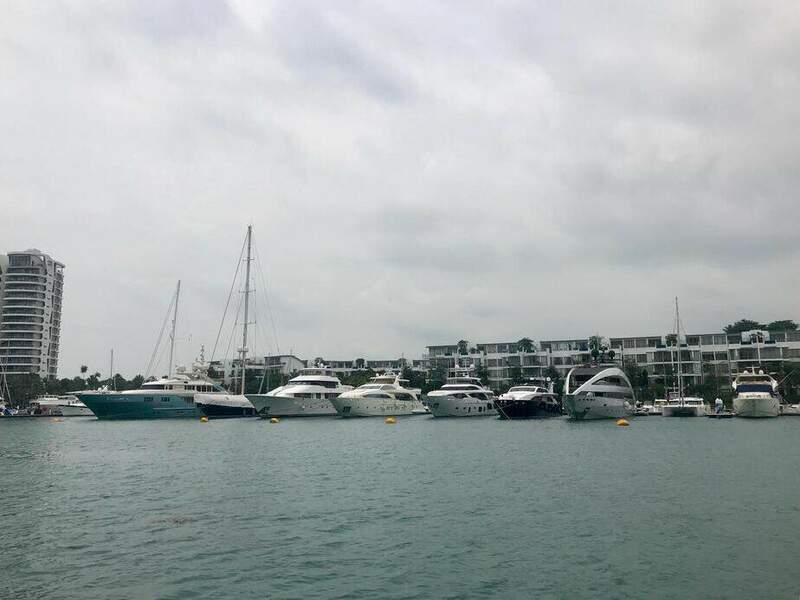 The marina did advertise a “Southern Island Expedition” day trip, mentioning islands such as Pulau Semakau, Kusu Island, and Lazarus Island. After 6 nights at the One15 Marina, we exited the country the same way we came in. We returned to the WQIA and passed paperwork over the rails. The officials gave us the all clear and we motored over to Malaysia.